I have taken a huge hiatus from this blog - mostly because I have not done anything creative of note except have yet another baby boy. I am now insanely busy with THREE boys and I pretty much feel like I'll get back to fun crafts in about 18 years. Anyway, the newest addition arrived in June and has been quite a handful (our first experience with colic - not fun) and I feel like I am just starting to pick up the pieces of my life again now that school has started and we are forced into a routine. The new pace of school has added to my exhaustion and I knew I had to do something about it. Having a baby sleep next to me is never restful for me. Especially one that is not cuddly, just demanding. He turned three months earlier in September and I decided it was time to carve out some space in our apartment for him. He is a very light sleeper and quiet darkness seemed like the way to go to get him to sleep a little better. 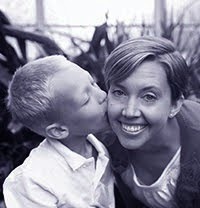 We live in the city - a fairly expensive city - and our oldest just started Kindergarten. So, moving is not really an option for us until at least the end of the school year. We love our place and our location, and we have a reasonable amount of space, so we are fine making it work. I have reorganized and "found" more space over and over again here, and it was time to do it again. This time was the biggest find-space-project I have yet undertaken. In our master bedroom, we have two full-size closets AND a walk-in closet that is about 5-1/2' square - pretty amazing for apartment living. 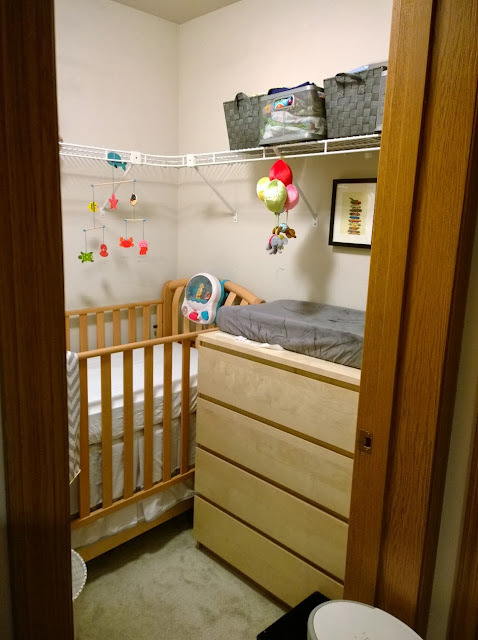 I knew if I could successfully empty out the walk-in closet, which I was using as a storage unit and pantry, I could turn it into a pretty believable nursery. 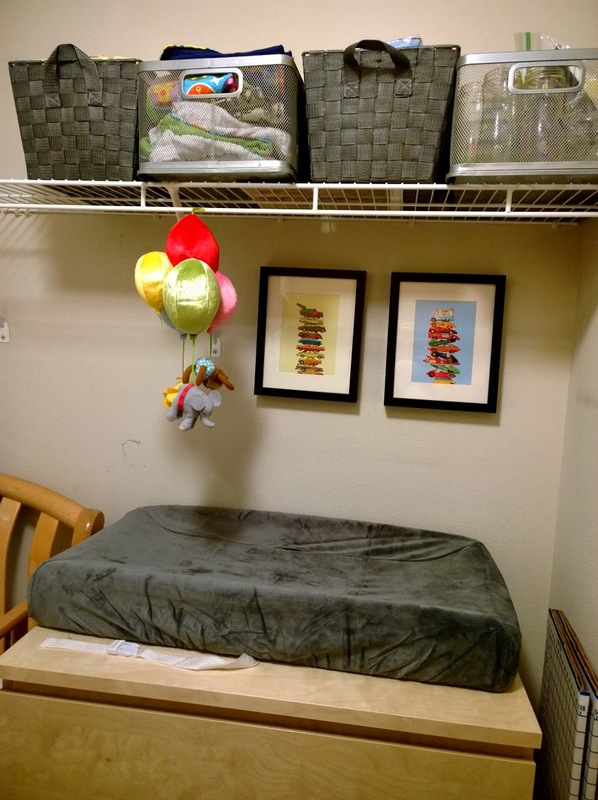 I also knew that the closet had to get completely emptied - no leaving stuff on shelves - because we live in earthquake country and I want my baby to be as safe as possible. So I worked hard to reorganize every other closet and cabinet to make room for what was in there. My mom was nice enough to volunteer to store all of our Christmas decorations in her garage. I managed to reorganize my whole house so that we didn't add any clutter, just really utilized all those closets and now we have a really great little nursery. It almost feels like a luxury to have a dedicated space for our baby. Best of all, is that I did it all for pretty much $0 cost. I spent about $150 at Ikea buying a new dresser for him and a couple odds and ends, and I bought a new crib skirt and a couple of stuffed animals to make it look more like a nursery, but I sold some stuff that was living in the closet originally and the proceeds actually will add up to more than $150 when I am done. 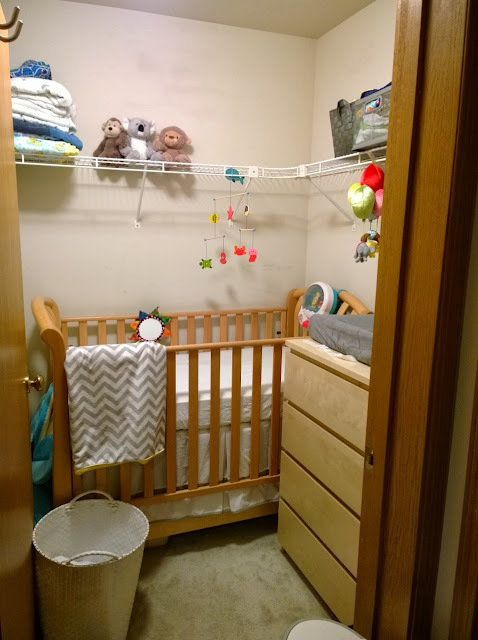 Most of what I used in the nursery were things we already owned (bins, laundry basket, crib, mobiles, etc. - I realize there is not a lot of stuff in there). In the end, I still have to get up a couple of times during the night to feed my chubby cherub, but I am more than grateful to have our bedroom back. As for the little nursery décor, I went with grey and white - this will fit in nicely with the big-boys' bedroom should they ever all share a room. I hung a couple of pictures on the wall to add a little bit of color, but nothing near the crib. This is my third kid, so I am all about being practical and realistic this time around. For the next phase of fitting our third child into our small apartment, see Brothers Share 100 Square Feet. This really is impressive. I mean really, really, really impressive!